A really powerful way to understand who you are is to imagine how your future would be if, all of a sudden, you would receive a big amount of money. Marty Neumeir call this exercise “The Rich Uncle” exercise. In his version of the exercise he uses it to investigate what motivate a person to work. “Imagine that you just received a $50 million from a rich uncle that you never knew you had. Would you go back to work the next day? I found this exercise really useful to understand how my ideal company should work and I recommend everyone to do the same before setting-up a business. In the early phase of “understanding your value”, though, I would simplify it in what I call “The Lottery Exercise”. As to quantify what a billion pounds are worth may be difficult, I created a board to help structuring an answer. 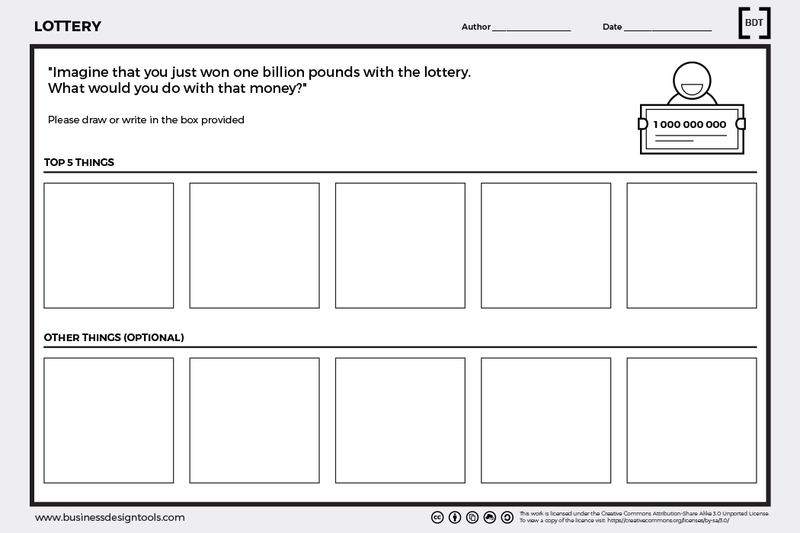 Template to run the lottery exercise developed by Giulia Piu. Neumeier, M., 2009. Innovation Workshop. Berkeley, California: New Riders. Sian Prime lectures during the MA in Creative and Cultural Entrepreneurship 2010.